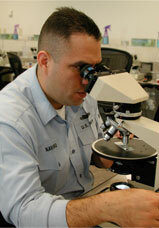 This introductory course thoroughly addresses microscope alignment and use, sample preparation procedures and techniques, as well as the microscopical observation and measurement of the optical properties that permit accurate asbestos fiber identification. Students are introduced to the optical and crystallographic characteristics of all the asbestos fibers, the various fibers that may be confused with them and the underlying theory that supports both the qualitative and quantitative aspects of sample analysis. Students must analyze a requisite number of samples, pass various quizzes and demonstrate proficiency with microscope alignment and use.